It was supposed to be an easy ride today, just 209km of nice coast road to be in Dubrovnik by mid morning with plenty of time to make the most of the day and visit the city, but things don’t always turn out as we would like. The moment we left Omiš it was clear that his warning was not to be taken lightly. Not since the fist day of my frustrated trip to Mongolia had I experienced such bad winds on the bike. The jagged coast and the winding road meant that the strong winds blowing from the sea buffeted in all directions, making it difficult to predict where the next gust was going to come from, and we had a few heart-stopping moments when a gust caught us from the wrong side while leaning through a tight corner. After only a few kilometres the sky ahead was completely black and we could see bolts of lighting striking the water and the cliffs relentlessly. It really did look like doomsday up ahead. As I was having these thoughts while fighting to keep the bike from being blown onto oncoming traffic or over the armco and into the sea, I felt a not-so-gentle tapping on my helmet – Nat had put her foot down and refused to continue riding in those conditions. I stopped the bike and by happy coincidence there was a restaurant right across the road where we took shelter from the wind after parking the bike securely to make sure it would not be blown onto its side by the wind. With a cup of coffee and Wi-Fi to check the forecast, we studied our options, which turned out to be rather limited. Nat squarely refused to get on the bike again, so we could not brave it and go on to try to ride through the windy bit and the storm ahead and neither could we go back to Omiš to spend the day there in the hope that the following day conditions would be better. So we sipped our coffee and waited for almost two hours. When the wind finally died down we rode on until we found the first road inland – we were heading for the motorway and away from the coast road in an attempt to escape the wind. It worked, there was almost no wind there, but the moment we had collected the ticket from the toll booth and were pulling onto the motorway, the skies opened and the wraith of God fell upon us in the form of a deluge. We stopped at the first service station we found, but our supposedly water proof gear was already soaked halfway through. We spent another two hours there, watching the rain fall and other miserable bikers come and go while we chatted to a Dutch guy who had friends in MotoGP. 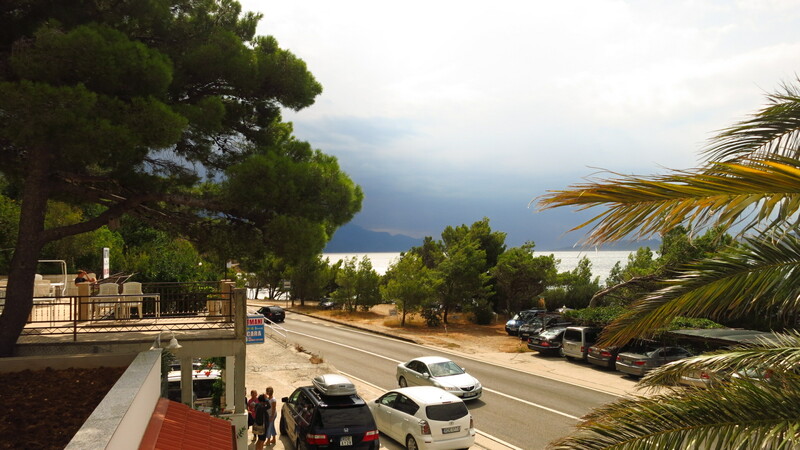 Seeing that thing were not going to change anytime soon, we hit the road again and to our delight conditions improved a bit by the time the motorway ended in Ploče and we started heading down the coast again towards Dubrovnik. We were more than halfway there, the rain had stopped and the wind too, but it was too soon to claim victory – there was one more obstacle to overcome. The region of Dalmatia, which comprises more than half the total lenght of the Croatian coast and at the southern tip of which Dubrovnik is located, is actually cut in two by a small Bosnian corridor that gives that country access to the Adriatic sea. This means that to get there you have to cross a border into a non-EU country, ride for about 10km and then cross another border back into Croatia. If you think this is a hassle, you are right. Now add to that thought the fact that we kkare talking about a narrow two-way coast road that cuts through all towns and villages and which is the only way to get to southern Dalmatia. In the midst of the high summer season. Our friend Josep had told us that he had spent three hours to get through the border, but we were not expecting to find traffic completely stopped 20km from the border. O n top of that, it started raining again, so I did not think twice and did the only thing I could do – change onto the opposite lane and ride towards incoming traffic. For 20km I rode on the wrong side of the road, pulling in between stopped cars when something big was coming the other way, like a coach or a lorry (or a police van), and then for 10km more in Bosnia, where the traffic jam continued because there was another border to cross down the road. Had I not done that we might still be waiting there stuck in traffic and soaking through and through. Just before crossing the border back into Croatia we stopped at a Bosnian petrol station to honour the tradition of getting a country sticker for the bike, which has to start earning them. It was the second this trip, the first one having been obtained in Croatia that morning. For the last 30km before Dubrovnik both the weather and the traffic finally cleared, even though the strong winds made an unwelcome return. We finally made it to our guesthouse at almost 19:00, got the cases off the bike and went for a night visit of the old town. 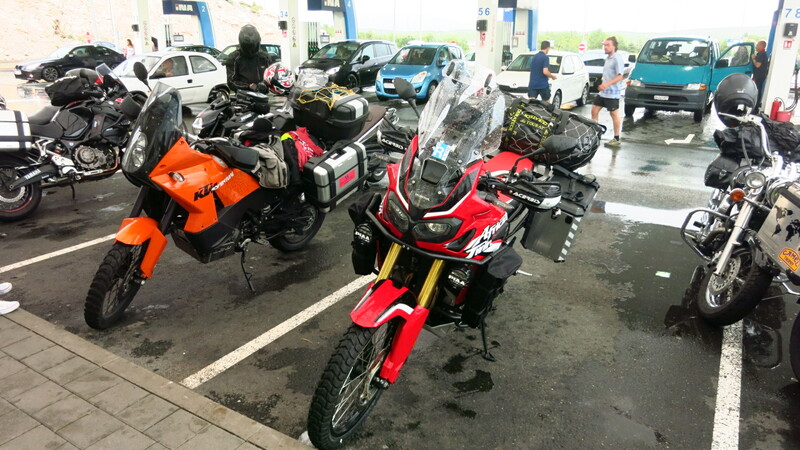 This entry was posted in Balkan Adventure 2016, Travel and tagged Dubrovnik, Honda CRF 1000L, Omis, rain by Kilian. Bookmark the permalink.